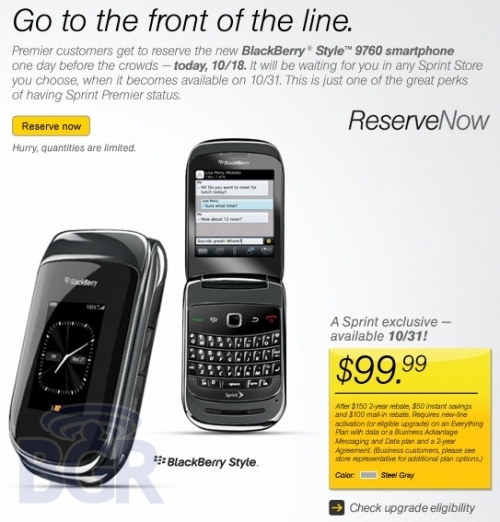 Sprint offers pre-orders of BlackBerry Style to Premier customers | BlackBerry Blast! Sprint has finally officially announced the BlackBerry Style 9670 flip phone, and is offering pre-orders to their premier customers. If you spend more than $100 per month at Sprint you should be a premier customer and you should receive the pre-order email offer. The BlackBerry Style 9670 sports a full QWERTY flip phone keyboard, a 624MHz processor, 5 megapixel camera, GPS, and Wi-Fi b/g/n and OS 6. The BlackBerry Style will officially launch on October 31 for $99 on contract.